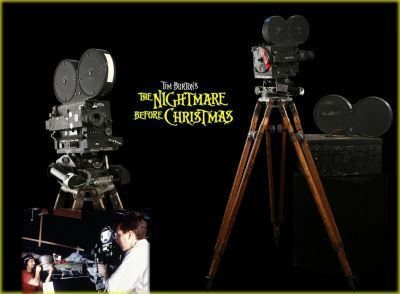 This vintage Mitchell 35mm motion picture camera was used during shooting on the classic stop-motion film The Nightmare Before Christmas. The Mitchell Standard camera, serial number 759, comes in its original case marked with labels for "Skellington Productions Inc". The camera includes its original movement, original "turret-style" lens mount, a 400' magazine, a motorized pan/tilt head, and a tripod. The tripod is tagged "Skellington Productions". Also included is a 1000' magazine for a different type of camera (Bell&Howell) that is tagged "Skellington Productions." The camera includes it's original rack-over base, and flywheel, but has no motor. This is a wonderful example of a classic Hollywood camera with fantastic stop-motion history.